C2 = make2DOF(C1) converts the one-degree-of-freedom PID controller C1 to two degrees of freedom. The setpoint weights b and c of the 2-DOF controller are 1, and the remaining PID coefficients do not change. C2 = make2DOF(C1,b) specifies the setpoint weight for the proportional term. C2 = make2DOF(C1,b,c) specifies the setpoint weights for both the proportional and derivative terms. Design a 1-DOF PID controller for a plant. Convert the controller to two degrees of freedom. The new controller has the same PID gains and filter constant. It also contains new terms involving the setpoint weights b and c. By default, b = c = 1. Therefore, in a closed loop with the plant G, the 2-DOF controller C2 yields the same response as C1. Convert C1 to a 2-DOF controller with different b and c values. 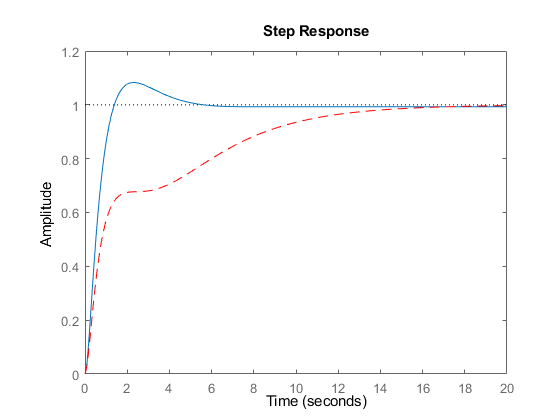 The PID gains and filter constant are still unchanged, but the setpoint weights now change the closed-loop response. 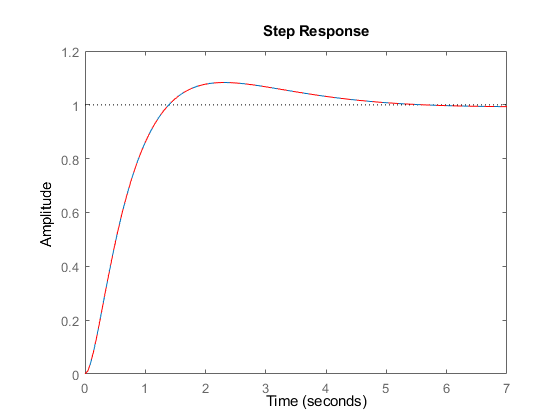 1-DOF PID controller, specified as a pid object or a pidstd object. Setpoint weight on proportional term, specified as a real, nonnegative, finite value. If you do not specify b, then C2 has b = 1. Setpoint weight on derivative term, specified as a real, nonnegative, finite value. If you do not specify c, then C2 has c = 1. 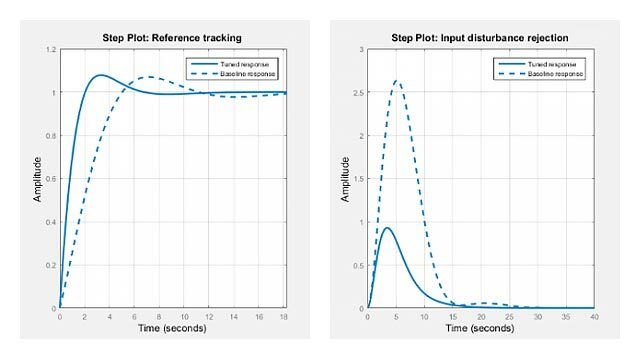 2-DOF PID controller, returned as a pid2 object or pidstd2 object. C2 is in parallel form if C1 is in parallel form, and standard form if C1 is in standard form. The PID gains Kp, Ki, and Kd, and the filter time constant Tf are unchanged. The setpoint weights b and c are specified by the input arguments b and c, or 1 by default. For more information about 2-DOF PID controllers, see Two-Degree-of-Freedom PID Controllers.